Michigan Wolverines offensive linesman Taylor Lewan (77) walks off the field after the game against the Nebraska Cornhuskers at Michigan Stadium. Michigan offensive lineman Taylor Lewan has talked with police about his involvement in the alleged assault of an Ohio State fan following the Ohio State-Michigan game in Ann Arbor last month. 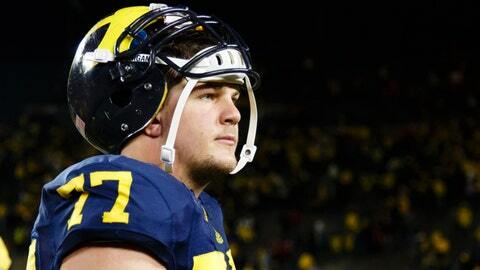 The Detroit Free Press reported that police interviewed Lewan about the alleged incident. "I wasn’t in any fight," Lewan told reporters after Michigan’s Christmas morning bowl practice in Arizona. "I didn’t hit anybody I was really trying to break up something." The Free Press report said Ann Arbor police aren’t commenting but are investigating an alleged assault near campus on the night of the Ohio State-Michigan game. A 29-year old Columbus man told the Free Press that he and a friend were assaulted by Lewan on a sidewalk outside a restaurant. The man, 29-year old Taylor Munsch of Columbus, told police and his friend were punched by Lewan and that Munsch was taken to the hospital. Lewan is an NFL Draft prospect and was the Big Ten’s Offensive Lineman of the Year in 2013 and 2013.